Here is the link to the Times article about pesticide exposure in the womb. Basically, 3 separate studies show that school-age children who were exposed to pesticides in the womb have lower IQs. Yet another reason to choose your food carefully and cook at home more often! When cooking for my family, I realize the benefit of organic; but, it is not always available, in the budget, or as fresh as local produce. As the Times article suggests, I use the Dirty Dozen and Clean 15 lists put out by the Environmental Working Group (EWG) as a guide and my recipes reflect this. In addition to organic produce, I also recommend organic dairy, pasture-raised meats, and eggs from pastured birds whenever possible. 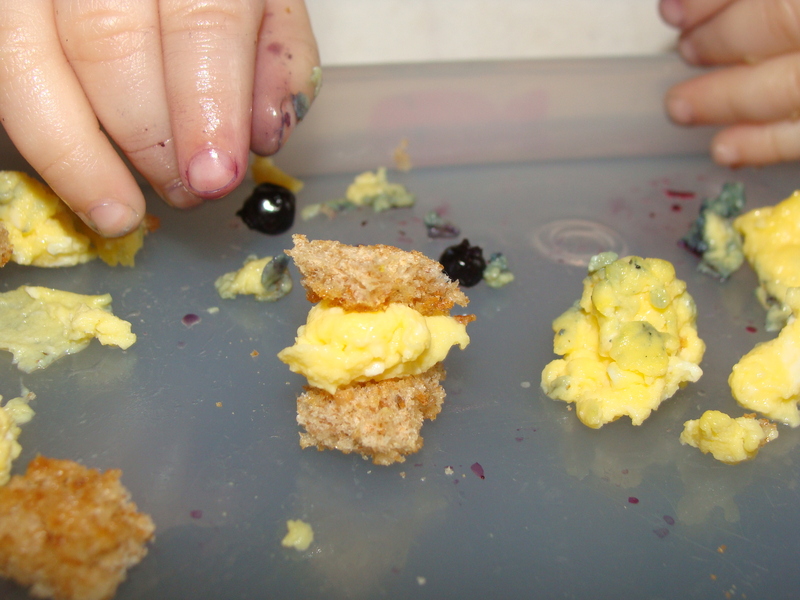 "A blueberry pincer grasp meets the World's Smallest Egg Sandwich"
Seems the last time I posted, peaches were in season–could that be right? New blog rules. Less chatter, more recipes. Or maybe just recipes. And more for the finger-fooding, puree-smearing set. Baby G is roughly 17#, nearly walking, and just sprouted her first tooth. Her Mom receives roughly 5 consecutive hours of sleep per night. More than the President (I think), but less than her husband. Gently mix the beef, oats, onion, garlic, milk, salt and pepper in a large bowl (using a clawed hand works best). Form into roughly 20 meatballs. Heat the oil in a large saute pan over medium-high heat. Add the meatballs and cook on all sides until a deep brown, about 2-3 minutes per side; transfer to a plate. Remove excess fat from pan, leaving just a sheen behind. Add tomato puree, vinegar, Worcestershire and sugar, stirring up any brown bits from the bottom of the pan. Bring to a boil. 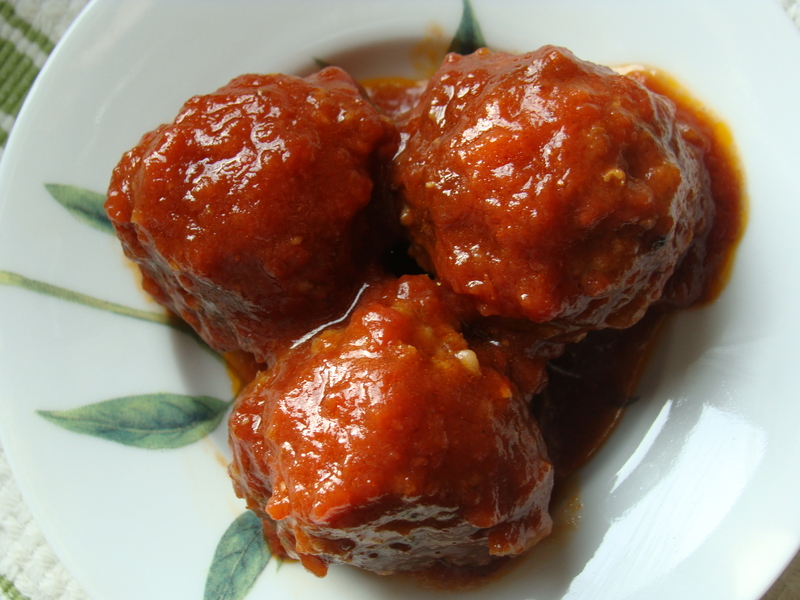 Add the meatballs and stir to coat with sauce; reduce heat to simmer. Cook uncovered about 25 minutes, turning the balls every 5 minutes. Test meatball’s temperature on your lip before serving to an infant. Serve with some chopped up steamed vegetables.